We had a busy September with my mom visiting and we went to Budapest. I will write up about our trip later. ​It is starting to get colder out there but don't allow that to keep you stuck indoors! There is a lot still going on! It is Black History month in the UK, you can find information about events around the nation here. ​The U.K. changes their clocks backwards the last Sunday in October whereas the U.S. changes their clocks the first Sunday in November. Here are a few events that I think you should consider. I will be going to quite a few. Lazy Carboot Sale- sellers from 11 am and buyers from 12 pm. Come and join the 95th Rifles military re-enactment group. A weekend of soldiering, musketry and drill. Curiosity Killed….No-one! 20th - 28th October ‘Why are flamingos pink?’ ‘Why is a giraffe tall?’ Just send us your questions and we’ll help reveal all! ​OCT31Mini Museum Club - Ahoy Pirates! 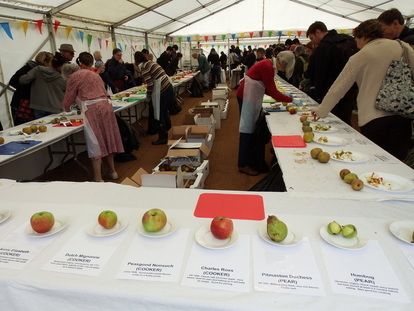 This national event marks the end of the harvest and is a celebration of this humble fruit. 50 Myths, Mistakes and Misconceptions! 20-28 October “I think you will find…” “Well I never knew…’ Just some things you may say after coming to the Zoo! ​Hazel’s Wondrous Wands-6th September - 7th October The Good Witch Hazel has been working on some spectacular spells and potions in the woods, helping her pumpkins grow! The Glorious Glowing Lantern Parade-13th October - -31st October Our most famous, fabulous, fantastical event of the year for October Half Term! Spend the day exploring the fascinating world of Fungi; collecting, identifying and learning about the amazing species found around the country park. Experience the dark side of Brandon Country Park on a night-time odyssey of astronomy, wildlife encounters and sensory adventure. Come and join us at Brandon market for free family activities, craft stalls and music.Activities include face painting, circus skills and art workshops. Come down and say hello to your friendly market traders and support your local town. There will be a special Christmas market on Saturday 1 December. It’s a celebration of film – past present and future. So, it’s a chance to relive and enjoy past glories, but also to see what’s happening in film right now, and reveal new talents who will shape the future of cinema. A good example of that is a chap who had his student short selected for the programme here back in 1996, named Christopher Nolan. Apparently he’s done quite well since! Of course it’s also a chance to see films from around the world, from other countries and cultures, many of which we might not otherwise come into contact with. And it’s all brought to our doorstep. It brings the people who make the films here, too, of course, so it’s a chance to meet and put your questions to actors, writers and directors. What makes Cambridge different from other Festivals is that it attracts big names but is nonetheless intimate and approachable. There are no red carpets, no banks of flashbulbs going off, and the chances are the acclaimed director of the much anticipated new film you’re about to see is happily hanging out in the bar, just like you! Our audiences like that – the filmmakers actually love it, too. Another particular quest of ours is outdoor screenings, or screenings in unusual places. We show films on Grantchester Meadows and at Jesus Green Lido and work with additional new venues around Cambridgeshire and beyond each year to produce unique, memorable events in special places. Cambridge itself is special and unique, with amazing spaces that are just crying out to be used and enjoyed creatively. The Cambridge Town and Gown is a closed road and scenic 10k run that starts on Victoria Avenue and finishes on Midsummer Common, It loops around Cambridge city centre before stretching along the beautiful River Cam, allowing you to embrace the stunning autumnal sights of Cambridge city and green spaces. Whether you’re a serious runner, or a fun runner, help us turn Cambridge orange in this chip-timed race and fundraise for our charity Muscular Dystrophy UK. We fight muscle-wasting conditions, by finding treatments and cures and improving the lives of the 70,000 people in the UK affected. Our work depends on the support of people like you. Chippenham Park Gardens will be open to the public on Sunday October 13th for a blaze of autumn colour. The gardens, lakes and borders are still full of colour and charm late into summer and we have Bellflower Nursery selling a selection of plants. Delicious home-made cakes, scones, coffee, tea and barbecued sausages and others refreshments are being laid on in the licensed Potting Shed Cafe. Fireworks across the dark winter sky, tempting and exotic aromas of Indian feasts in the air, music and laughter, celebration and lights… colourful lights, everywhere: this is Diwali in Leicester, and it truly is a one-of-a-kind experience. Diwali celebrations in Leicester are famously some of the biggest and best outside of India. The festivities are loudest along Belgrave Road, in the heart of the city's Asian community, where the two main events take place each year. The fantastic Diwali lights switch-on brings the Golden Mile alive with light and colour – be prepared to gaze in wonder at an explosion of fireworks and over 6,000 lights, twinkling against the night sky. Two weeks of cultural celebrations are rounded off on Diwali day with a bang! A spectacular fireworks show is the culmination of a night of Bollywood dances and music performances. This is a street party like no other – over 35,000 people of all faiths attend the switch on of the lights on the Golden Mile, and even more come along on Diwali day itself to experience the buzzing street atmosphere, be dazzled by colourful fashion and gold jewellery shops and indulge in the mouth-watering food on offer from some of the country’s finest Indian restaurants. But it’s not all about the Golden Mile. The Diwali lights radiate out across the city in the form of a cultural event programme – from theatre performances to craft activities, cultural talks and exhibitions – there’s events for people of all ages and cultures to learn about and get involved with the celebratory spirit of the festival. Diwali Festival is organised by the Mayor of London with support from the Diwali in London Committee. Diwali Festival is an official UK/India 2017 event. Most run during term time only. King’s College- Monday-Saturday 5.30pm, 10:30 am and 3:30pm Sunday. Monday- King’s Voices (mixed voices); Wednesdays Men’s Only and full choir the other days. 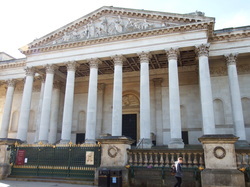 Both the Fitzwilliam Museum and the Cambridge University Botanical Gardens have events for children to take part in. Botanical Gardens- 11.00-13.00, £3 for children to participate, normal admission charges to adults. The Festival of Ideas is a great way to get exposed to some of the stuff that Cambridge University has to offer and also see things from a different perspective. The best thing is it's free! There are things for all ages, find out more here. Fun Palaces is both an ongoing campaign for culture at the heart of every community, and an annual weekend of action – arts, science, craft, tech, digital and sports events and activities – run by and for local communities. Fun Palaces weekend is the first weekend of October every year. The next Fun Palaces weekend is 7th & 8th October 2017. Halloween is not as big as in the States but you can still get your scare on! Ultra's: These are min 32 miles and consist of an additional 6 mile route after the completion of the marathon route (which serves as the last checkpoint). Half marathons: These are roughly 13 miles as above. Routes: All entrants start at the same time and location which makes it easy for those doing half marathons to start their day with friends and family, completing approximately the first 6 miles of the marathon course and splitting at the first checkpoint. Here are my pictures from the events I have taken part in. Halloween - Norwich - 31 October 2018 -Spooky City parade from the city centre to Chapelfield Gardens with ghoulish activities. We put a spell on you!The three witches you love to hate are back and more magical that ever, flying high in this wicked Halloween Pantomime. Magical illusions, pop songs and things that go bump in the night all form the essential ingredients of this bewitching plot, sure to delight youngsters and adults alike. Saturday 19th October- Chamber Music Concert - Yevgeny Sudbin. Further details to follow. 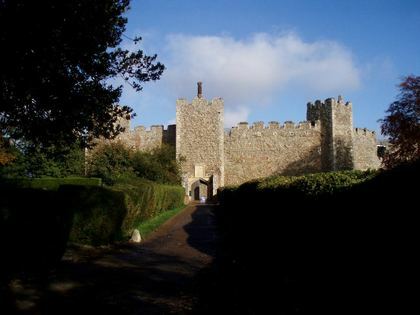 The Horror at Hinchingbrooke House is an award winning interactive and realistic horror experience located in the famous haunted grounds and house in Huntingdon, Cambridgeshire. Experience pure adrenaline and terror as you journey through dark rooms, forests and hedge mazes being hunted by axe wielding freaks, chainsaw maniacs, killer clowns, demonic creatures and more! We create a BRAND NEW MAZE every year so you can come back year after year and always enjoy a new experience! Join Nora Gardner on a journey of hearty 17th century cuisine to warm the soul during these autumnal nights. Learn about Mrs Cromwell’s favourite dishes of the season as well as her preserves for the year ahead. 05OCT Animal Tails: Day and NightExplore the animal kingdom with stories and play. Discover animals that are awake at night and asleep in the day, and create an owl mask to take home with you. Session times: 10:30am to 11:15am and repeated 11:30am to 12.15pm Suitable for children aged 2-5. 05OCT Gallery tourTake a tour around the new lower gallery and hear some of the stories behind the collections and redevelopment of the Museum of Zoology. Suggested donation £5. Booking essential. 05OCT Gallery Tour: Charles DarwinTake a tour around the new Museum of Zoology and see specimens collected by Charles Darwin. Learn about his time in Cambridge and the lasting impact of the friendships he made here. Suitable for 12+ and adults Suggested donation £5. Booking essential. 25OCT Big Draw at the Museum of ZoologyDrop in to draw at the Museum of Zoology. Discover life on mountains, in deserts, at the poles and under the sea, and make a creature to add to the ‘stream of extremes’ in the Museum. 26OCT Big Draw at Museums at Night: Animal ExtremesVisit the Museum after hours, buy a glass of wine and be inspired to draw by the amazing collections of the Museum of Zoology. What would life be like as a tiny whale, an ENORMOUS flea, a speedy sloth or a cheetah moving at a snail’s pace? Join us as we turn animal extremes on their heads. Suitable for 18+ Free. Drop-in. Nottingham's Goose Fair returns from Wednesday 3 to Sunday 7 October 2018 at the Forest Recreation Ground to thrill and delight city residents and visitors. Visitors to the fair will enjoy more than 500 attractions - from the latest white knuckle rides for thrill seekers to the ever-popular family, children's and old-time rides. Goose Fair is one of Europe's largest travelling fairs with a history that dates back more than 700 years. Amongst the array of Roller Coasters, Water Rides, Giant Wheels, Bombers, Dodgems, Twists, Waltzers and Miamis familiar to Goose Fair there will be a number of new attractions that have not visited Nottingham before. - Event run by a local astronomical society often involving an in-depth presentation by a guest speaker with observing afterwards if weather permits. 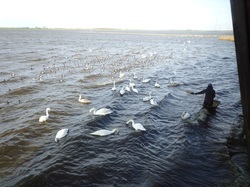 Most societies welcome members of the public to join them sometimes for a small fee or donation. The world famous Oktoberfest is coming to Bury St Edmunds! The Apex will be transformed into a Bavarian Wundeland offering a taste of authentic German culture, tongue in cheek German stereotyping and only the best Oktoberfest beer. The Perkins Great Eastern Run is a half marathon in Peterbourgh. It is a really nice one as it is relatively flat. It takes place in October and is one of the ones I enjoyed the most because it was also only one loop. If you are looking to have a PB, this is the one for you. Be an Astronaut for a DayThursday 2 August - Friday 26 October 2018 - 09:30 An out-of-this-world space-themed adventure for ages 8-14 years. Museum of the MoonPeterborough CathedralFriday 5 - Sunday 14 October 2018 - 09:00As part of Vivacity’s 'Without Walls' programme, the stunning 'Museum of The Moon' is coming to Peterborough Cathedral from the evening of 5th October until 14th October. 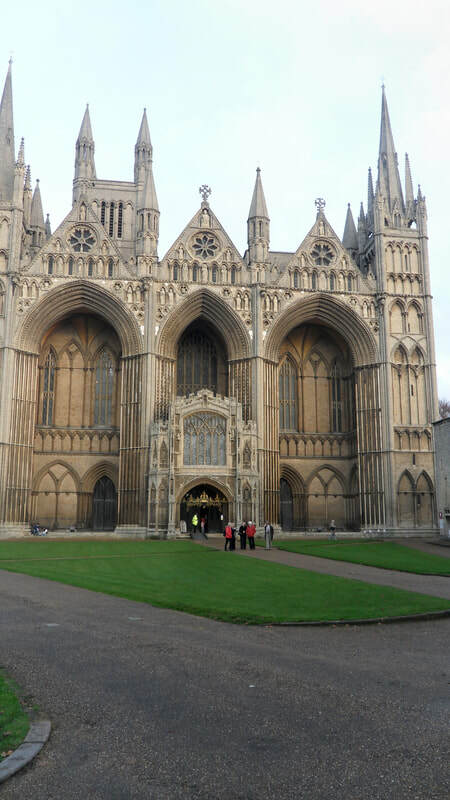 Forward TogetherPeterborough CathedralSaturday 6 October 2018 - 18:30A celebration in music and words. Peterborough Cathedral Trust celebrates the Commonwealth's contribution to the Armistice in 1918 and the 900th anniversary of Peterborough Cathedral. Silent Disco under the MoonPeterborough CathedralFriday 12 October 2018 - 19:00Silently dance the night away by the light of the Museum of the Moon. A special event for all the family. Life in Space talksThe Knights' Chamber, Cathedral Visitor CentreThursday 25 October 2018 - 10:00Explore life in space at this exciting and informative workshop from the National Space Centre. ​StarDomePeterborough CathedralFriday 26 October 2018 - 10:00Step inside the StarDome for an immersive experience of our amazing solar system. A fantastic day out for all the family, and our biggest event of the year, including all that's great about the Fens: heavy horse and vintage/classic ploughing; traction engines, working displays and stationary engines; classic cars, static engines, classic cars and static tractors; bygones, models, crafts, and trade stands. Activities for children, including magician JezO. Live music, real ale bar and hot food stands. Our fabulous collection of restored diesel engines will be demonstrated throughout the day. Free! During Michaelmas and Lent terms (Oct-Mar), the Institute of Astronomy hold free public nights to look at the sky through their telescopes. 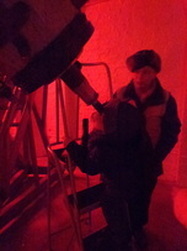 Find out more here and go on a clear night! 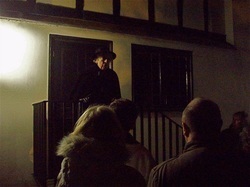 Scaresville is a haunted village that mysteriously appears in the grounds of Kentwell Hall in Suffolk every autumn. It is one of Britain's Top Scare Attractions, and previous winner of a prestigious Screamie Award. AIRSHOW: RACE DAY (FINALE)6 SUN OCT 2019BOOK ONLINETickets available to book online. 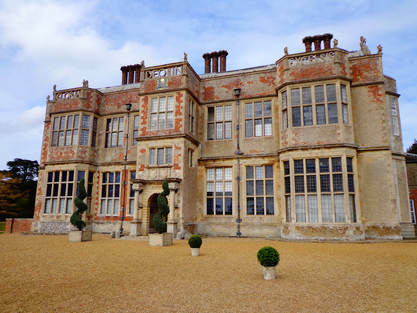 VISIT THE HOUSE13 SUN OCT 2019EVENT DETAILSBOOK ONLINE-The House will be open between 09:30 – 12:30 giving you a chance to explore the rooms, the grounds and see other areas not normally open to public. AFTERNOON TEA (OCTOBER)13 SUN OCT 2019EVENT DETAILSBOOK ONLINEAfternoon Tea in the magnificent House at Shuttleworth. HALLOWEEN MURDER MYSTERY EVENING26 SAT OCT 2019EVENT DETAILSBOOK ONLINEA well-known performing paranormal group ‘Raising the Dead’ are in attendance to celebrate the release of Mel O’Drama’s book, ‘Ghostly Secrets’. Every October Weekend, and the October half term week. All dates we will be open from 10am to 5pm. 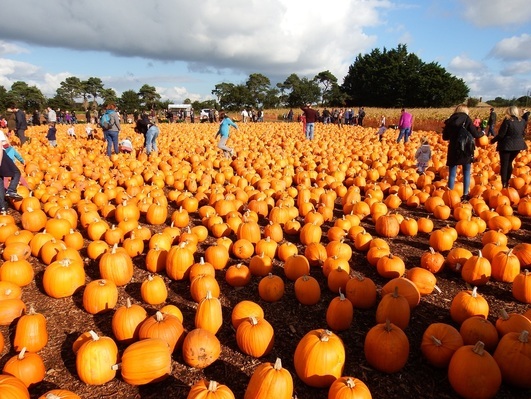 Pumpkin Picking, themed Maize Maze, Bounce and Climb including the giant inflatables, bale climbing area, plus Refreshments as well as Craft Stalls, Face Painting, Donkey Rides and the craft area. The Free Craft Corner includes lots of glittery, sparkly craft supplies, paints and colours, as well as wonderful activities – all these craft activities are FREE and exclusive to visitors of the Undley Pumpkin Patch. We welcome visitors to the mill to see the mill working, milling flour. 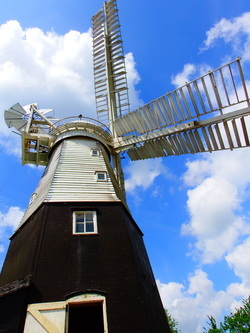 The mill is open on the 2nd Sunday of every month from 2pm to 5pm when, wind permitting, the mill will be working. Dungeon Lates-11-18 October 2019- STRICTLY FOR ADULT TRAITORS! Dungeon Lates mashes up theatre, special effects and intriguing storytelling with wit, humour and plenty of edge of the seat surprises for an after-hours experience like no other. The Haunted Castle - Halloween-19th October - 3rd November 2019- With wondrous witches, Horrible Histories and the return of the spectacular Fire Joust, experience Warwick Castle’s biggest ever Haunted Castle event this Halloween. Medieval Banquet-19th October 2019- History is bought to life in our famous Medieval Banquet. Dine back in time in this immersive, interactive evening feast complete with live music and medieval entertainment. Enjoy one of the best wildlife spectacles in the UK this winter, from the comfort of a heated hide! ​Wimpole Murder Mystery: A Cause to Die For?The Wimpole Murder mystery is back, this year with a very a topical theme as we celebrate the 100th anniversary of the granting of partial female suffrage in 1918. A chance to exercise the little grey cells and look round Wimpole Hall after dark. Wimpole Murder Mystery: A Cause to Die For? (Cloned)The Wimpole Murder mystery is back, this year with a very a topical theme as we celebrate the 100th anniversary of the granting of partial female suffrage in 1918. A chance to exercise the little grey cells and look round Wimpole Hall after dark. Hedge Laying Courses 2018An introduction to hedge laying using axes and billhooks where you will learn how to lay a Midland style hedge.